Adding both style and functionality to your windows, our range of electric wood Venetian blinds are an attractive addition to any home interiors scheme. Enjoy the warmth and beauty of wood with superior blinds for bedrooms, living areas and throughout the home. Operating your new blinds couldn’t be easier. With the help of a switch, a remote button or even an app, you can open, close and rotate the slats to the finest of adjustments. For your ultimate peace of mind, all our electrically operated wood Venetian blinds are manufactured to order in Aquarius Blinds’ own UK based plant. Regardless of the size of your windows, we are confident that we can find a solution to help you gain perfect control of your home design and light adjustment needs. At Aquarius Blinds, no job is too big or too small. We are able to produce powered wood Venetian blinds in widths ranging from 50mm to 2700mm, and in drops up to 3000mm. All our Venetian blinds come in 50mm wide wooden slats. Abachi Wood, also known as African Maple or African Whitewood, is a hardwood species native to west central African countries such as Cameroon, Ghana, Nigeria and Zaire. It is a lightweight and durable wood in a light colour that naturally ranges from creamy white to pale yellow. Abachi wood slats have a unique embossed pattern that will add beauty and warmth to any window in your home. At Aquarius Blinds, we offer Abachi Wood Venetian blinds in 17 colour finishes. Basswood is a beautiful, rich hardwood, especially selected for its stability, uniform colouring and texture, and resistance to warping. Widely grown in North America, it’s lightweight and very strong and perfect as a material for window blinds. Naturally light coloured, Basswood can be stained to suit any interiors style. 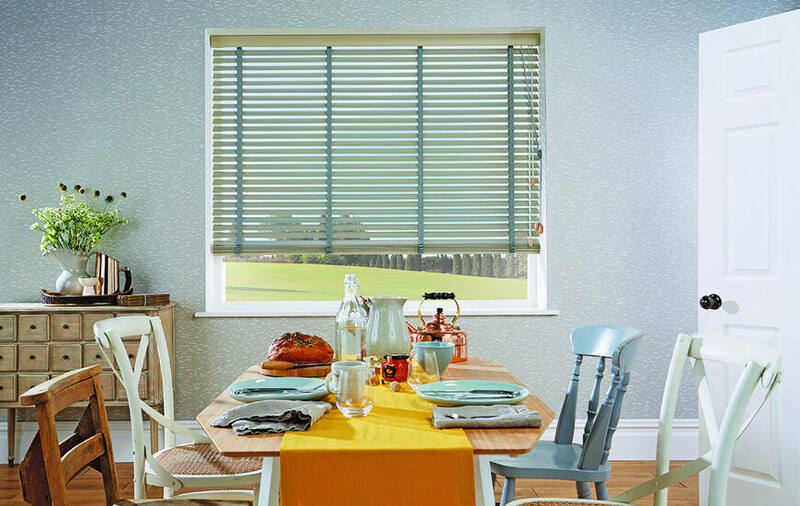 Our Basswood Venetian Blinds can be ordered in a choice of 27 colour finishes. To add the perfect finishing touch to your blinds, we offer our entire range of 44 wood colours in complementing wooden fascia panels. When used in situations such as bay windows, we will produce fascias mitred to follow the head rails as well as returning at the end. Our range of control movements means that you are in full control of your window treatments at the touch of a switch or a remote button – or even from a mobile device such as a smartphone or tablet. Control levels of light, temperature and privacy by setting your blind at exactly the right position for your needs, day or night. The advanced Somfy® RTS system allows you to operate your motorised blinds on a timer and from remote controls, wherever you are inside or outside the home. Just plug in the RTS receiver and the power is in your hands! Our complete selection of power and control options for blinds also include solar, battery and mains controls. As an experienced manufacturer of electrically operated blinds, we can advise on the correctly specified motor to use with your chosen size of blinds. Let our experts guide you through the process and match the motor and control option to work with your design and requirements. Operating your electric Venetian blinds brings a multitude of options. From switches to remotes and timers to apps, we have simple solutions for adjusting the light, shade and temperature of your room. With a smartphone or tablet controlled app, you can operate your blinds remotely and schedule them to work with local sunrise and sunset times, if you wish. Wherever you may be, complete control over your window blinds is in your hands. For all your window covering needs, the friendly, professional team at Aquarius Blinds should be your first port of call. We have 30+ years’ industry experience and an ongoing commitment to investing in high quality manufacturing equipment to keep us at the forefront of technology. This way, you can be assured that all the luxury blinds we supply and fit are of exceptional quality. Why not call us today on 0800 953 0199 or email info@aqblinds.co.uk for further information on how we can transform your home with electric wood Venetian blinds? Visit our showroom for inspiration and chat to one of our experts to find the right solution for your home.